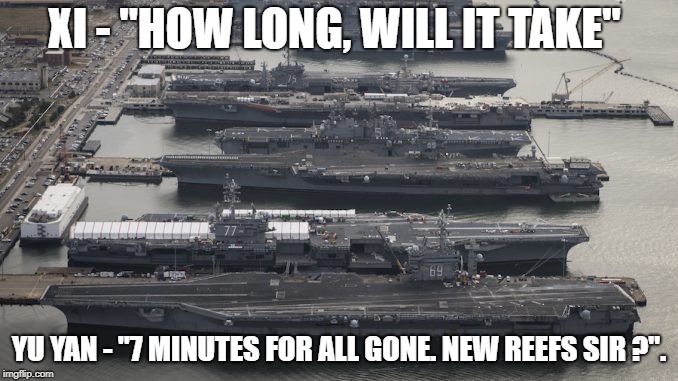 US Pacific Fleet Prepares For Global Show Of Force To Warn China: Media 3.6666666666667 out of 5 based on 3 ratings. 3 user reviews. The US does these sorts of operations all year round, but this time it focuses several of them in the span of just a few days, if the proposal is true. According to one of the anonymous officials, it is “just an idea,” but it is in its advanced stage, with even having a operational name. The source refused to confirm the name of the potential operation. The ties between China and the US have been worsening rapidly in the past weeks, following the escalations in the trade war between the countries, which appears to be leaking into other areas of interest. Following the latest round of tariffs in the trade war, in which the Trump administrations imposed 10% of tariffs on $200 billion in Chinese goods on September 24, in addition to the trade measures already in place. The Chinese government responded in kind, with between 5% to 10% tariffs on $60 billion of US goods. Beijing called off any plans for trade talks with Washington. “How could you negotiate with someone when he puts a knife on your neck?” China’s deputy trade negotiator Wang Shouwen said at a press conference on October 2nd. Trump also, on September 26th, during his chairmanship of the UN Security Council meeting on nuclear proliferation, began his address by accusing China of planning to meddle in the upcoming November mid-term elections. He did, however, provide no evidence whatsoever, his aides were also caught unaware. Yes indeed, any rational country would respond by developing their military. My peers in the U.S. are incapable of empathy. We never look at things from the other country’s perspective. I can’t believe that we think that threatening China will deter them from wanting to defend their own coastline and waterways. As if they should forever remain helpless and wait for us to force them to buy opium again (more satire). Thank God, there are now people on here that could post that same comment in all seriousness. Hahahaha – try it McD Yanker. The US has raided the piggy bank, and will send the fleet on a pointless mission, to try and convince the world they are not broke.